Baker Motor Vehicle Company was a manufacturer of Brass Era electric automobiles in Cleveland, Ohio from 1899 to 1914. The first Baker vehicle was a two seater with a selling price of US$ 850. One was sold to Thomas Edison as his first car. Edison also designed the nickel-iron batteries used in some Baker electrics. These batteries have extremely long lives, and some are still in use. The model range was expanded in 1904 to two vehicles, both two-seaters with armored wood-frames, centrally-located electric motors, and 12-cell batteries. The Runabout had 0.75 hp (0.6 kW) and weighed 650 lbs. 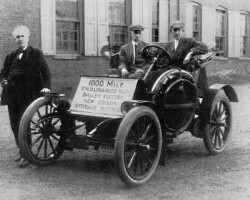 The Stanhope cost $1,600, weighed 950 lbs, had 1.75 hp (1.3 kW) and three-speed transmission. It was capable of 14 mph. 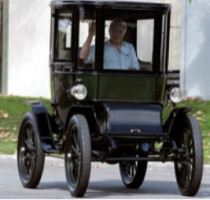 In 1906 Baker made 800 cars, making them the largest electric vehicle maker in the world at the time. They bragged that their new factory was "the largest in the world" in advertisements. The company also made a switch from producing Baker Electric Carriages to automobiles. According to the company promotionals; "We employ the choicest materials in every detail of their construction and finish, producing vehicles which in every minute particular, cannot be equaled for thorough excellence." The 1906 Baker Landolet was priced at $4,000. The company also manufactured Imperials, Suburbans, Victorias, Surreys, and Depot Carriages. By 1907, Baker had seventeen models, the smallest being the Stanhope and the largest the Inside Drive Coupe. There was also the US$4,000 Extension Front Brougham with the driving seat high up behind the passengers mimicking a Hansom cab. Baker also introduced a range of trucks with capacity of up to 5 tons in 1907. 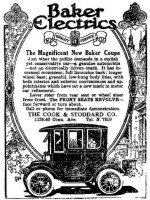 The Baker of 1910 was the only electric that had a heavy series wound motor of 300 percent overload capacity, with a commutator "absolutely proof against sparking and burning under all conditions." By late 1913, the company advertised their new model as "The magnificent new Baker Coupe" and that the car was "just what the public demanded, a genuine automobile, not an electrically driven coach." That year, the car had "increased roominess, full limousine back, longer wheel base, graceful, low-hung body lines, with both interior and exterior conveniences and appointments which have set a new mark in motor car refinement." Another new feature were revolving front seats which faced forward or "turn about."